Blog / Florence / Florence…. as it used to be! Florence…. as it used to be! The Firenze Come Era museum is a true hidden gem in Florence. It is a really small museum sharing space in the Convent of the Oblate with the city public library (awesome library – go to the last floor to the cafe and enjoy the view of the Duomo as you munch on a panino sandwich). The name of the museum – literally “Florence as it was” – indicates the nature of the collection. 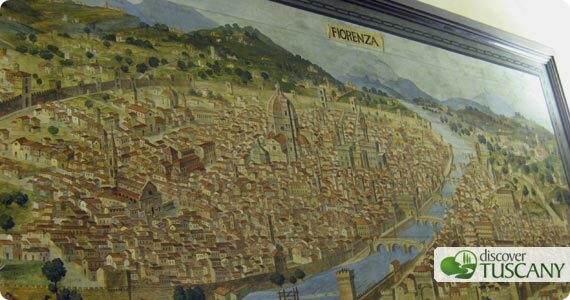 Divided into two sections, the prehistoric/Roman history of Florence on one wing and maps and visual representations of the city on the other, the museum visually shows how Florence used to be in past times. The plastic model of Roman Florentia is one of the most beautiful items, showing how the Roman city was laid out, showing the location of the amphitheater (below Palazzo Vecchio), the Colosseum (near Santa Croce), temples, baths (one was in Piazza della Signoria!) and aqueduct in relation to today’s streets and churches. The photos I took don’t render the size and beauty so you’ll just have to go see it yourself! The maps and paintings on the other hand are photographs of that time. A bird’s eye view of the city from 1490 shows the city as it looked from the hills, and from here you can clearly see landmarks – the Medieval walls and gates, some of which are still standing today, the missing Fortezza da Basso since it wasn’t yet built and so on. 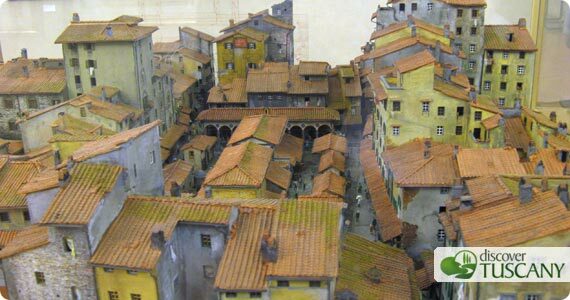 Another plastic model shows the area of today’s Piazza della Repubblica where the Jewish ghetto and market were located before being dismantled in the second half of the 19th century. This shows how medieval Florence had withstood time, up until it was decided that it needed to be “modernized” when it was shortly the capital of Italy. While the collection might be most interesting to those that already know Florence a bit – the fun part is looking for and finding the differences in landmarks today – I highly recommend a visit to anyone interested in seeing how Florence has changed through the passage of time. To the Marradi chestnut festival on the steam engine train!